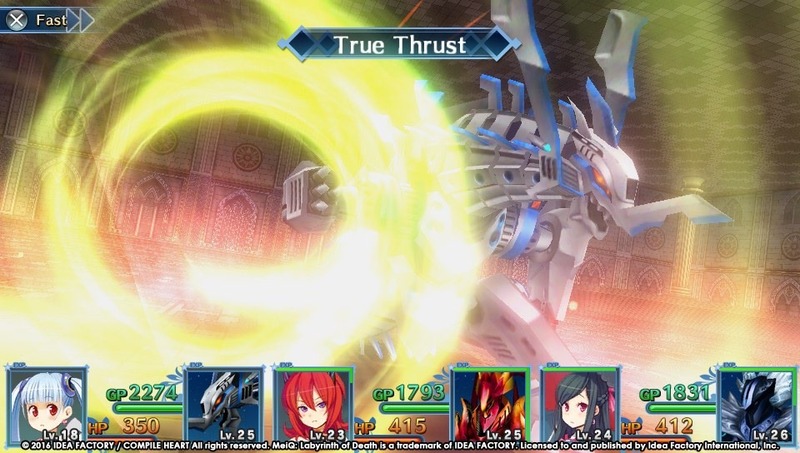 Idea Factory and Compile Heart are names that have become synonymous with the Hyperdimension moniker. Despite consistently blundering from a critical standpoint, the series defies all naysayers with near constant releases coming out in Japan and not-too-long-thereafter launching internationally for fans worldwide to enjoy. 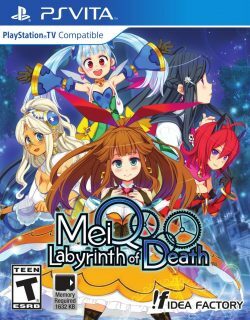 As a totally new IP and in a little explored genre for the company, MeiQ: Labyrinth of Death represents an opportunity to prove that Compile Heart is no one trick pony and that there?s more up their sleeves than a half dozen more Neptunia games. MeiQ is set in a world that has fallen under an eternal night; a curse that can only be lifted by a hero capable of traversing several towers to undergo various rituals, form contracts with various guardians and restart the revolving of the world. The only eligible hopefuls are those in command of machina or this game?s version of magic. Thus mankind?s best hope for survival is of course a group of barely dressed, suspiciously young and gloriously proportioned girls. The game features beautiful character artwork and though there isn?t much variety past the main cast, they all feature unique charms. Other visuals past the artwork are rather lackluster thanks to some bland environments and enemy models, but there is at least some variety in this department. Thankfully the game includes dual audio and I quite enjoyed the original character voices. 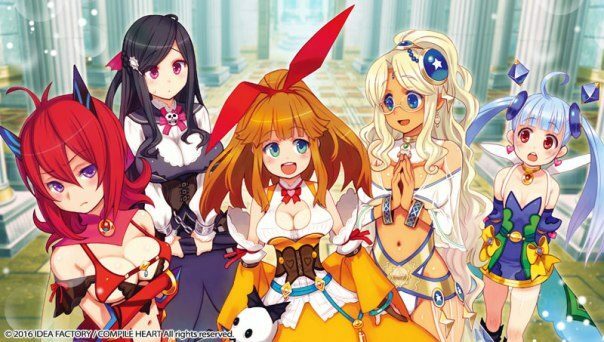 Character interaction is minimal and the game?s narrative is threadbare, with several hours of dungeon grinding only rarely being broken up for a new scene or development. The cast is small but likable and in the end the story didn?t become a big motivation for toiling through the countless identical random encounters. There is some character development but it?s usually very brief and not incredibly meaningful when it does rear its head. Despite the high stakes of the quest the cast never seems too downtrodden. 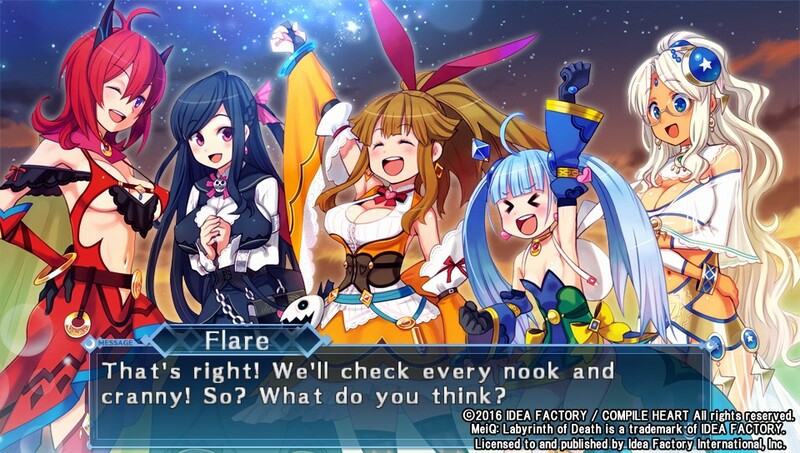 The cute characters are definitely amorous though; perhaps the best word to describe the game?s story is light. There is a shocking lack of unique event artwork and outside of the anime opening, I didn?t see any other cool anime scenes. 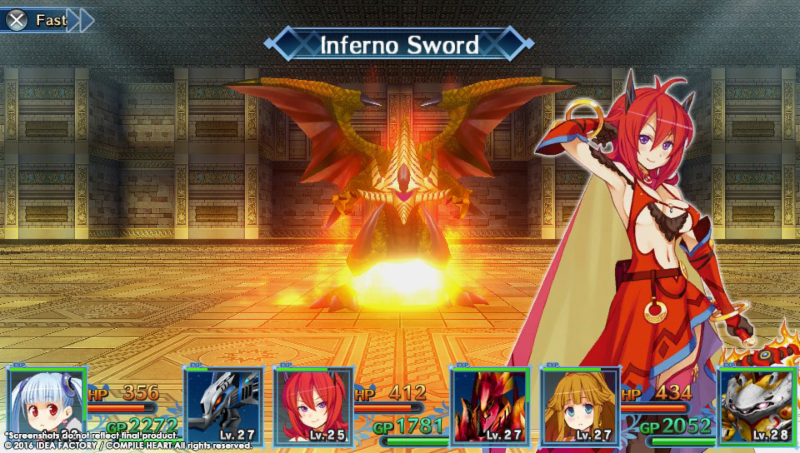 The lack of production in the story telling department made the game boring and it completely lacked the cinematic flair of some modern JRPGs. 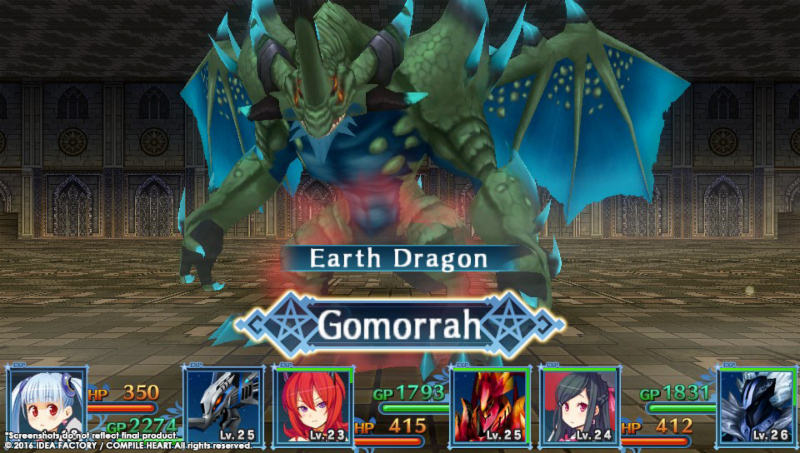 While some similar games may feature more interesting developments or motivation around each bend, I?d argue that the dungeon RPG sub-genre overall is less story focused than some of the more traditional JRPGs, but this isn?t news to fans. The gameplay is where the DRPG typically shines and in that regard, MeiQ doesn’t make a tremendous effort. 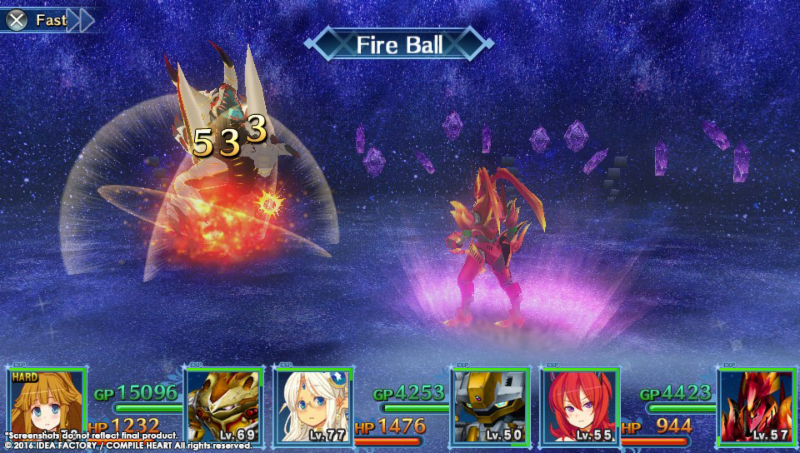 In the turn-based battles you control characters who themselves are attached to different guardians. 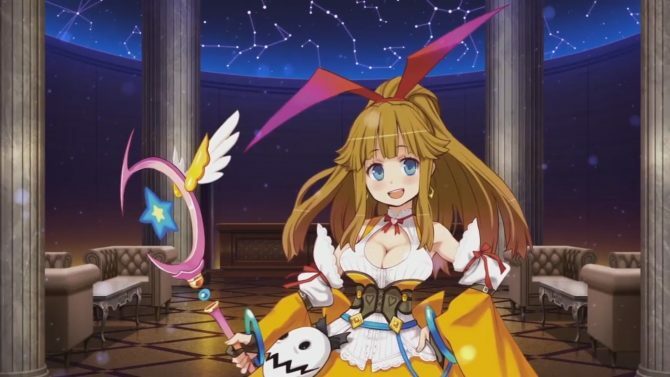 The characters are useful for casting powerful support, attack magic, and using items but they are extremely fragile; direct attacks from enemies can two-shot or even one-shot standalone characters. The guardians are the pivotal members of the game?s combat. 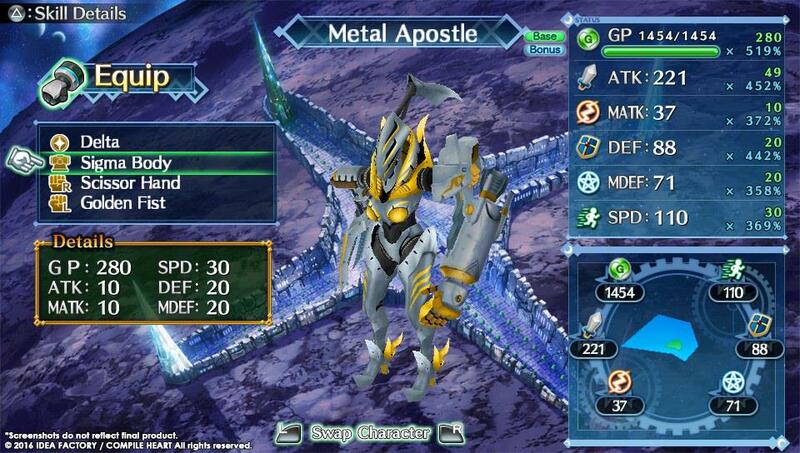 They pack huge health pools, increasing great stats and powerful attack skills. The guardians become strong enough to make the actual characters seem pointless but they?re connected to each other. The guardians can?t act without a character present and guardians can?t heal themselves or use machina. This encourages a certain kind of harmony as you alternate between offense and defense and the potential is there for some interesting combinations. 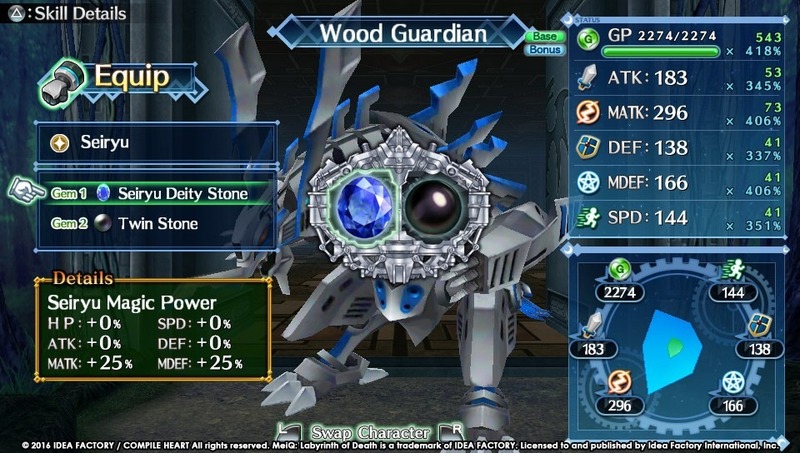 You can also customize each guardian?s skills and stats by swapping out parts that you create, discover in dungeons or buy from the general store. The game makes mundane mob grinding a cinch with the repeat and fast forward functions. If you have a certain combination of attacks that generally defeats an entire mob, you can use it and then repeat it the moment you enter an encounter with the press of one button. You can then skip attack animations on the fly by holding X. The result of these intuitive systems is that, with the right customization options, most random encounters last only three or four seconds. This manifests as a gift and a curse though. On one hand, leveling is a breeze and, in fact, you?ll likely hit the level cap much sooner than is typical for this kind of game. On the other hand, the complete lack of challenge from even serious skirmishes is pretty damning. Sometimes the encounter rate seems to just skyrocket for 30 second periods and you?ll be blazing through dozens of enemies in a matter of minutes; unless you flee from encounters a great deal, I can?t imagine any way you wouldn?t become over-leveled. The brisk challenge typical of the genre is nowhere to be found. Most boss fights ended in one turn and I was never knocked out. There is an elemental weakness system that you?re encouraged to be mindful of but it didn?t seem necessary for guardians to use attacks of their same affinity. The depth of combat rests almost entirely on unlocking more parts and making your characters even more overpowered with new skills. That said, I can?t deny the addictive balance between razing hordes and continually tinkering on the guardians. There is very little in the way of customizing the characters themselves. 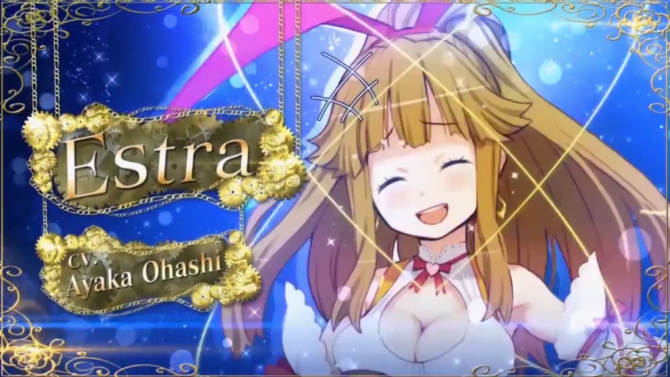 There is no class system per se but the main character grant a specific bonus depending on which form she assumes, while all the other characters have predetermined forms. The different costumes for the main heroine are nice but the attached effects seemed minimal enough to make it strictly a cosmetic choice. It seems like the class system and diverse lists of character skills were omitted because it wouldn?t be terribly useful if it did exist. The guardians would still end the fights instantly so it would seem somewhat pointless. The lack of models for the actual characters also seems rather strange. Watching the encounters fly by so quickly somehow in the end makes the game seem just as grind heavy. It also exposes the lack of variety in other areas of the game. The maps are generally very straightforward although to the game?s credit they grow in size and scale throughout the game and there are some secrets to be discovered. The maps lack sophistication and there could (and should) be much more to discover: more instances of character interaction, more NPCs here and there, more details to enhance the game world, some stronger enemies, more interesting items or any number of other things to break up the monotony of the dungeons would have been awesome. Also, the map in the game is terrible. You can only view the current floor and you can?t zoom in on or scroll around, which made navigation more of a chore than it had to be in the bigger sections. I tried to sidestep this by snapping screenshots of the maps of different floors, but MeiQ forces you to close the game in order to open the gallery, which I?ve never seen a game do. It would have been a convenient workaround to an ugly issue. The weapon creation system takes a backseat to buying rare items from the general store because you?ll have so much excess money from the nonstop grinding that the steep price tags won?t be a problem. In comparison, the weapons you discover recipes for are terribly outdated by the time you discover them.The by-the-numbers customization makes simple stat crunching more important than going for specific pieces for combos or ? dare I say it ? strategy. You can take on quests from a guild in town, but these are almost entirely fetch quests to turn in drops from random enemies. You?ll most likely get the drop from one of your hundreds of encounters between visits to the town and when you turn them in the rewards are equally unexciting and mundane. You expend an ether resource to create parts but when you have no need to create parts you rack up hundreds of thousands of ether and have nothing to do with it, which is disappointing. MeiQ really isn?t that bad of a game. The beautiful artwork, fresh spin on combat, guardian building and elegant solution to power leveling are all strong elements. The environments are vast, though lacking in substance, and the shallow narrative is held up by likable characters with lots of? plot. However, with so little nuanced challenge, harshly repetitive gameplay, mindless combat, unexciting story progression, no class or otherwise deep customization systems, barren maps and unrewarding exploration, item creation and character building in general, it falls far short of the genre’s best and barely executes, much less improves upon a seemingly simple formula.